Patience, while a virtue, isn’t something that’s familiar with a lot of gamers. With high speed internet connections, ever faster RAM and CPUs that cut a swathe through loading times, and fancy graphics renderers that keep all the texture right there, so close you could touch them, waiting isn’t something we want to do a lot of. But the problem is MMOs are by and large very large, settling down on your hard drive in the tens of gigabytes. Even the patches, as juicy as they are, are a frustrating delay when all you want to do is hop on and talk to your friends while you slaughter innocent monsters. Trion Worlds is going a good way to fixing all that frustration by making its patcher allow you to play while you download the files necessary to patch. While this isn’t a miracle and you won’t be able to play the new content without having downloaded it, it will mean that you can get on with playing all the other parts of the game while it fills in all the blanks that you haven’t seen yet. By the time you get over to them, there they’ll be, as if by magic. No loading bars, no frustratingly shouting at the download speed whenever it dips under the optimum, and no cheering once it achieves that blistering pace you pay some faceless ISP so much money for. The most exciting part of all of this is that it doesn’t just apply to patching. 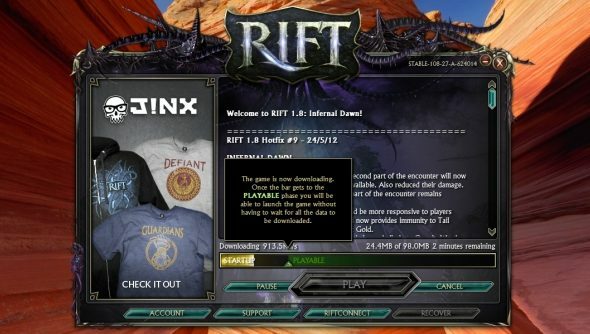 If someone wants to try Rift for the first time, they can download the trial version of the game (for free) and once they start downloading 20mb into it they can start creating their character. Once they’re beyond that the game will pull down the map and character assets on the fly as it loads the first level, leaving you in the game within ten minutes. When MMOs are as big and unwieldy as they are, especially with players who live in more remote areas with worse connections, have the option to try a new MMO within ten minutes of even having the idea to is removing an incredibly large barrier for entry from in front of them.